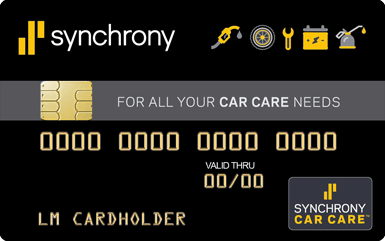 If approved, use your Synchrony Car CareTM credit card for routine maintenance like gas and car washes, as well as larger automotive repairs and purchases on tires, brakes, windshields, transmissions, and more! Pay for scheduled maintenance and unexpected repairs over time with 6 months promotional financing on purchases of $199 or more* at over 30,000 locations. It's safe, secure, and convenient with $0 fraud liability and a dedicated mobile app to manage your account. Please apply at the shop . ​Approval chances DOUBLE when you apply in person! But, if coming to the shop to apply in person is not an option for you, please click below to apply online. *Subject to credit approval. Valid everywhere Synchrony Car Care is accepted in the U.S., including Puerto Rico. Gas station purchases are not eligible for promotional financing. 1 For new accounts: Purchase APR is 29.99%; Minimum Interest Charge is $2. Existing cardholders should see their cardholder agreements for their applicable terms. 2 FICO® Scores are available by accessing the online account servicing site at mysynchrony.com. Scores are available online only to primary cardmembers with an open account. FICO is a registered trademark of Fair Isaac Corporation in the United States and other countries. 3 Cardholders may be required to provide their annual net income if their recent information is not on file. Cardholder income will be used as a factor to determine eligibility for a credit line increase.